Where do we begin, probably the beginning is the best place. 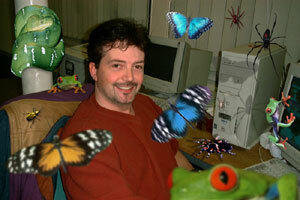 As a young five year old I discovered I liked what most people really don't, "Creepy crawlies". 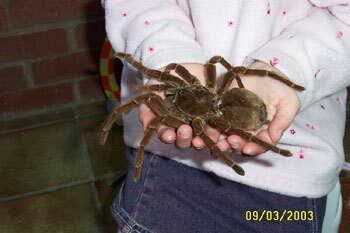 Bugs, worms, spiders, beetles, in fact anything I could find under a rock or piece of wood I would keep as a pet. As you can imagine I had hundreds of pets which sent my mother crazy. The childhood obsession never left me, through my teenage years I would write to Butterfly farms, Zoological societies and Entomological groups and drive them crazy asking for Goliath beetles from Africa and Tree frogs from every corner of the planet, in fact anything new or unusual that they had imported I wanted. For the last twenty years I have kept and bred many rare and exotic species. Captive breeding is the only way to help save some of the rare and diminishing species on the planet. Over the years I have kept Snakes, Chameleons, many species of lizards and horned frogs, but my main area has been not just the herpetological line but also the invertebrates. 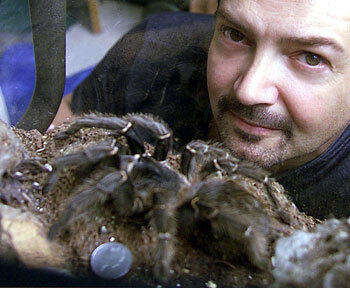 I keep many species of tarantulas, bird eating spiders and true spiders from around the world, praying mantis and stick and leaf insects which I breed. At the moment I am breeding a rare species of giant stag beetle from Malaysia, and giant golden Nephila orb weaving spiders from Kenya and hopefully soon my Red-eyed tree frogs from central America. 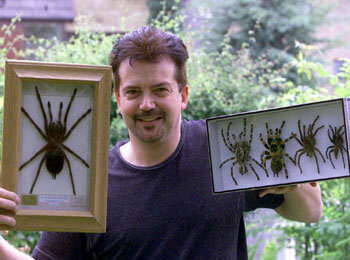 Among my collection are a few monsters, the Goliath bird eating spider,(Theraphosa leblondi) which is from a mammoth strain and can attain a fourteen inch leg span and the worlds largest species of Centipede (Scolopendra gigantea ) from Amazonia which can attain well over one foot in length and preys on snakes and rats in the wild. My experiences with the rare and in some cases hard to breed species over the years has given me a greater understanding of habitats and precise conditions for the more delicate creatures, and I have helped with information in the past for zoological societies on the maintaining and identification of species. With the ever increasing exotic pet trade, there is a lot of new ground being broken every day in the keeping of these amazing creatures, I've read hundreds of books but nothing compares to the experience of keeping and breeding them first hand. I have traveled to some of the most tropical places around the world and seen a great many of the creatures that I keep in there natural habitats, this is priceless information. If you are in need of help on maintaining a stable environment for a new exotic pet or general information on the up-keep, temperature requirements, humidity etc., please contact me at gedc@ukgateway.net I will reply to your E-mails as soon as I can, so feel free to pick my brain, there's a very good chance the answer is in there. Movie of BBC News," Giant spider Guinness World record attempt."